Construction on Asia’s first ‘vertical forest’ is underway in the Chinese city of Nanjing in an effort to tackle the nation’s pollution crisis. The Nanjing Towers will be decorated with around 3,600 trees, shrubs and plants which will absorb 25 tons (22,680kg) of carbon dioxide each year, producing about 132lb (60kg) of fresh oxygen daily. 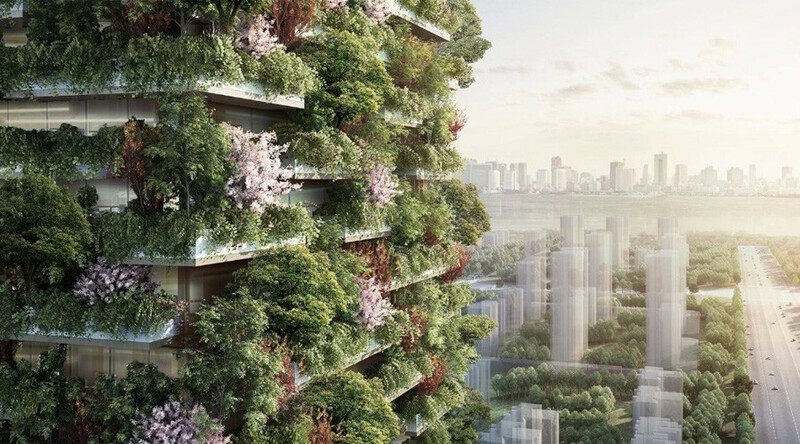 The residential towers’ facade will be stylized with 23 species of hundreds of medium and tall-seized trees as well as 2,500 “cascading” plants and shrubs, covering an area of 65,000 sq ft (6,000 sq meters) in total. Outdoor air pollution killed a total of 1,032,833 people in China 2012 or the equivalent of 76 per capita, according to a report released by the World Health Organization (WHO) last year. Meanwhile, a 2015 study by Berkeley Earth found that pollution contributed to 4,000 deaths a day in China, with nine out of every 10 residents experiencing more than 120 hours of unhealthy air. Scheduled to be completed in 2018, the towers are a light at the end of a smog-filled tunnel for the heavily polluted region which has been increasingly cracking down on pollutants and working towards creating a more eco-friending environment. Similar towers are also in the works for other Chinese cities including Shijiazhuang, Liuzhou, Guizhou, Shanghai and Chongqing, according to the Italian architect entrusted with the task, Stefano Boeri. The towers are the third prototype for Boeri’s firm, following the first of its kind in Milan and second in Lausanne, Switzerland. “More than 80 percent of people living in urban areas that monitor air pollution are exposed to air quality levels that exceed the World Health Organization (WHO) limits,” the WHO said last year. Vertical forests offer metropolises across the world an ability to absorb toxic smog and promote urban biodiversity without sacrificing valuable real estate space. Singapore’s ‘Gardens by the Bay’ nature park is currently leading the way with its 250-acre (101 hectare) futuristic man-made garden, featuring a ‘Supertree Grove’, flower dome and cloud forest conservatory.